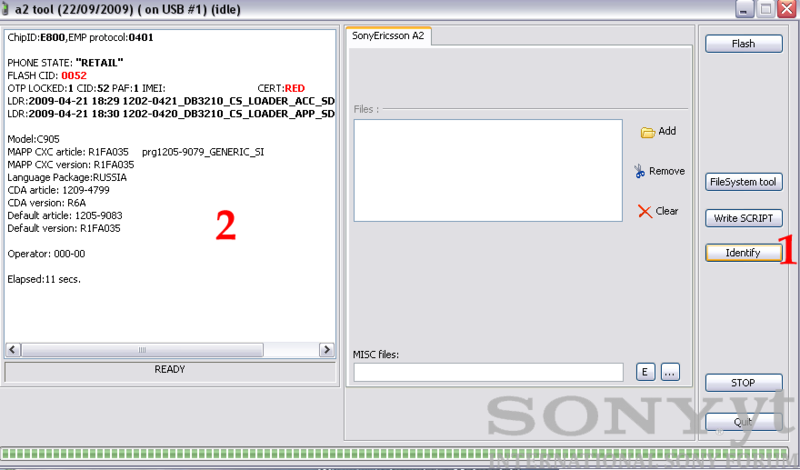 A2 uploader (A2 tool) is the best free program for flashing Sony Ericsson phones with CID 52 -53 based on DB3150, DB3200 and DB3210 platforms. This short tutorial is for the newest A2uploader v.22.09. Attention! There is no viruses inside that package. If you can't run a2 uploader, just turn off your antiviruses, download program again, extract and run it. 1. Dialog window showing log from operation. 2. Here we can add firmware. 3. Here we can add customization files or vkp patches using button with three dots. 4. That button begins flashing procedure. 5. By pressing that button we get access to the file system of our phone. 6. Button useful for writing patches and scripts into the phone. 7. Button used for phone identification. 1. Turn of the phone. 3. Hold on "c" or "2and5" buttons and connect USB DCU60/65 cable. 4. After a few seconds in left window you can see informations like: model info, IMEI, Flash CID, certificate (RED, BROWN or BLUE) and firmware version. 1. Backup your data from the phone using for example My Phone Explorer program. All data stored in the phone will be erased! 4. 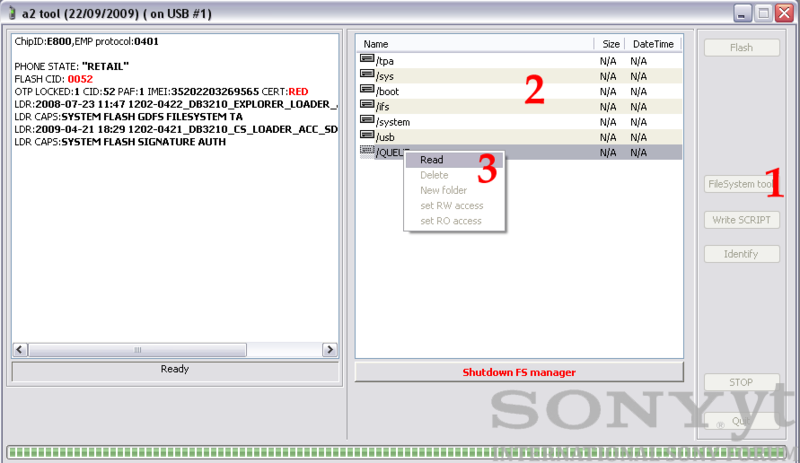 Add firmware files ( section marked with the 1 digit): main (mbn file) and file system (fbn file). - Make sure, that you have correct firmware files. 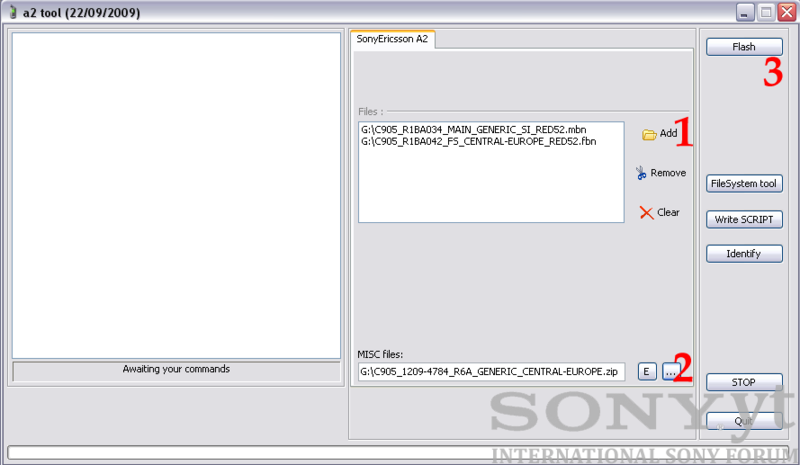 For example, for not branded central europe firmware main file should be marked as GENERIC, file system as central_europe. 5. 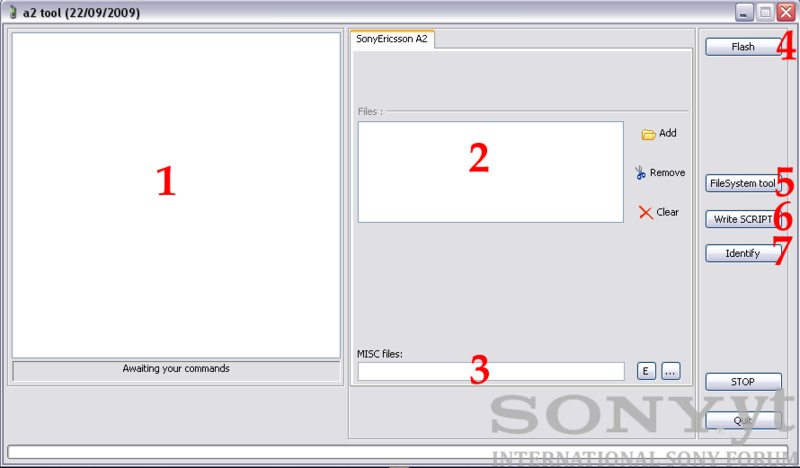 Add customization file (compressed with zip archive) into the section marked with 2 digit. 6. Press flash button, hold on "c" or "2and5" buttons and connect usb cable into the phone. 7. Wait approximately 10 minutes until program will finish flashing procedure. 8. When program will show in left column "READY" - disconnect and turn on the phone. 2. Press "FileSystem tool" button. 3. Hold on "c" or "2and5" buttons and connect USB cable. 4. After a few seconds we will get access to the phone's file system. If you want copy any file from your computer, just go into the correct folder in your phone and "drag&drop" file from your computer. 5. If you want to copy a file from phone into PC, just click PPM on the file and press "Read". Attention! You cannot copy files from the phone with CID 53 RED. You should convert phone's certificate to BROWN or BLUE if you want copy files from CID 53 phone. 6. After finished work press "Shutdown FS manager", disconnect and turn on the phone. Tutorial written for Sony.yt - copying and redistributing strictly prohibited.